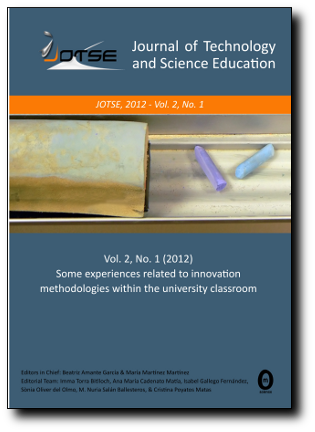 We invite you all to participate in the next issue of JOTSE by sending articles related to any teaching experience taking place in your classrooms. In this sense, our aim is to implement improvements during the learning process or while investigating within the field of teaching. In the case of teaching experiences in particular, we would rather include those carried out in a subject, in a group of subjects or in a whole degree from the scientific and technological area. Through JOTSE we would like to create a professional forum to exchange and disseminate any contribution that may involve educational innovation so as to achieve a more significant learning for our students at scientific and technological universities. Hence, our readers could use such proposals as a model to be applied and/or adopted in their own contexts. In fact, we have a special interest in receiving communications/articles related to experiences that imply a methodological change (when compared with a more traditional approach) and encourage or motivate students’ participation in their own learning process. These innovations could include from a “simple” change in the way of teaching or assessing a theoretical content, some lab activities or solving problems to a complete Engineering or Architecture Studies teaching plan design, in which evaluation and gradual implementation of generic or cross-curricular competences are obviously involved.